When we setup TNG we take care of the majority of the initial configuration of the program. There is one important section that you should complete and a few areas that you should not modify. IMPORTANT: The "Database Tables" area should not be modified. If you enter anything different than what we already have for these fields, your TNG website will no longer be able to communicate with the MySQL Database that we have already setup. Please do not modify this section. 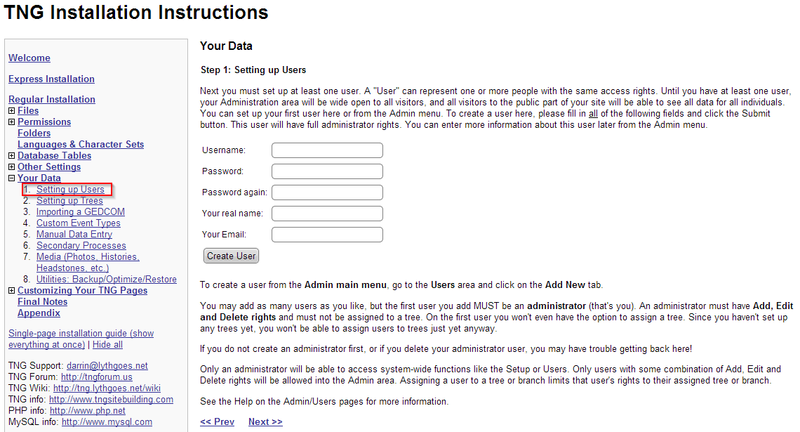 The one thing that you need to do is setup a new Admin user for your TNG installation. Please follow the link in the ReadMe file to "Your Data" (under the "Regular Installation" section) and then complete the "Setting up Users" form to create your Admin user. This is very important for the security of your TNG installation and it is highly recommended that you complete this step as soon as possible. Please remember the information you enter here because you will need it in the future to access the administration area of TNG. There is additional information contained in the ReadMe file, so please read through it if you want to make additional setup changes or need additional guidance.